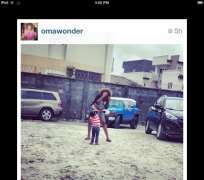 Warri-born singer, Omawumi has showed off her daughter, which she got from a baby father. The singer has kept the identity of her babydaddy very confidential since she was delivered of the baby girl. She is one of the top female singers and entertainers in Nigeria. Omawumi is also one of the Glo ambassadors. In July 2013, the singer allegedly assaulted a journalist in Lagos, which was reported by Nollywoodgists.com.